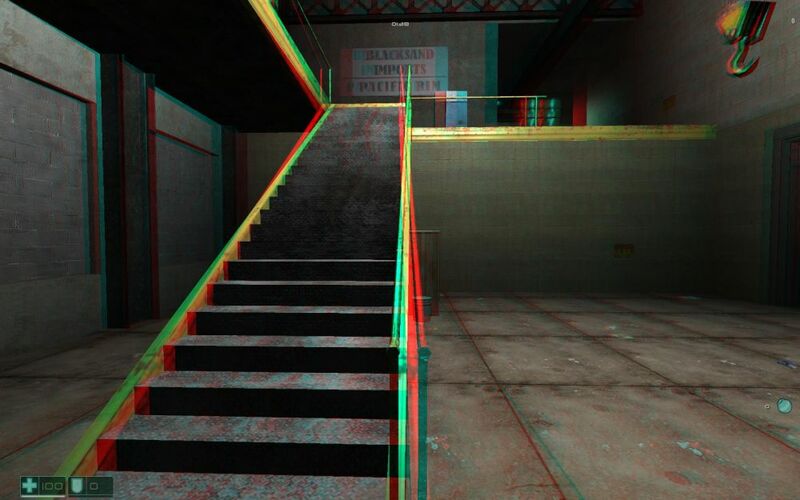 Let’s take a look at the three different 3D scenarios with actual video game images. There is a wide selection of far superior full color stereoscopic 3D solutions out there, but for our purposes, we are going to demonstrate these concepts using anaglyph red/blue images. With the colors, you will be able to see how the visual elements relate to each other. In the case of anaglyph, the red side goes over your left eye, and the blue side goes over your right eye. The images are captured from Fear Combat by Sierra. Depth 3D is where you can see into the screen like a car windshield, but nothing ever penetrates the glass. Look carefully at the staircase. 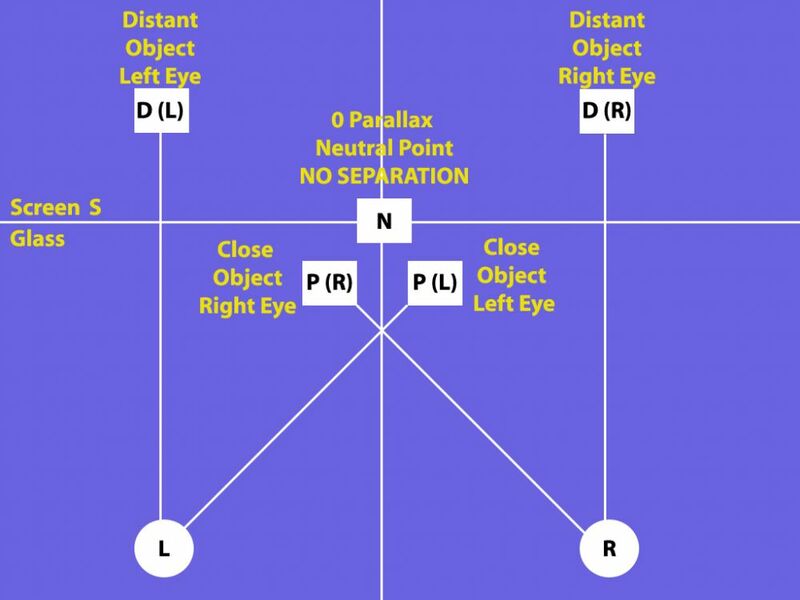 Remember, everything in red is what your left eye sees, and everything in blue or with a blue tinge is what your right eye sees. The further into the scene you look, the further apart the separation or the doubling is. Meanwhile, as the scene gets close to your personal space, the images join together. 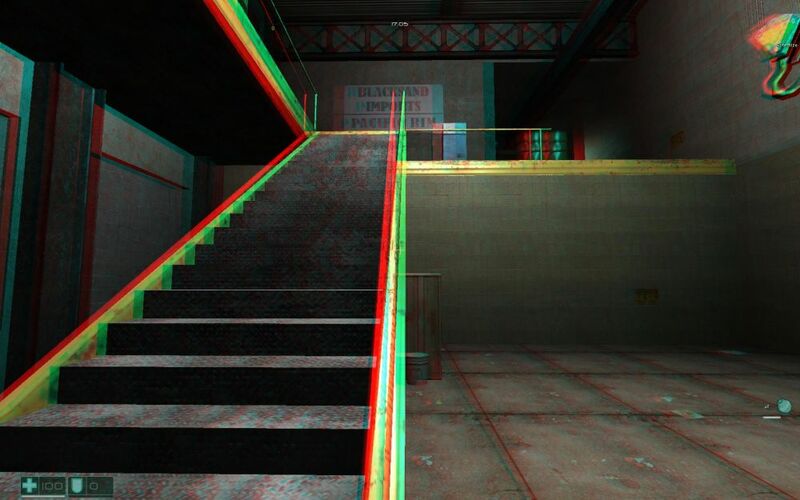 This is an example of a depth-only stereoscopic 3D experience. Looking at the diagram, the back of the room is in positions D(L) and D(R), and the bottom of the staircase is in position N. Nothing goes beyond the S line which is why you don’t get the pop-out sensation. Pop-out 3D is when things seem to come out of the monitor, but the background is flat. Look at the back wall on top of the staircase. There is zero separation in the distance, and therefore, there is no depth to be seen in the background parts of this picture. Now look at the staircase. Notice how it separates more as the image gets close to you? Unlike the earlier photo which showed depth by having the red color on the same side as your left eye, this shows the red color on the opposite side where your right eye would normally be looking. This cross-eyed technique is what creates that pop-out effect. 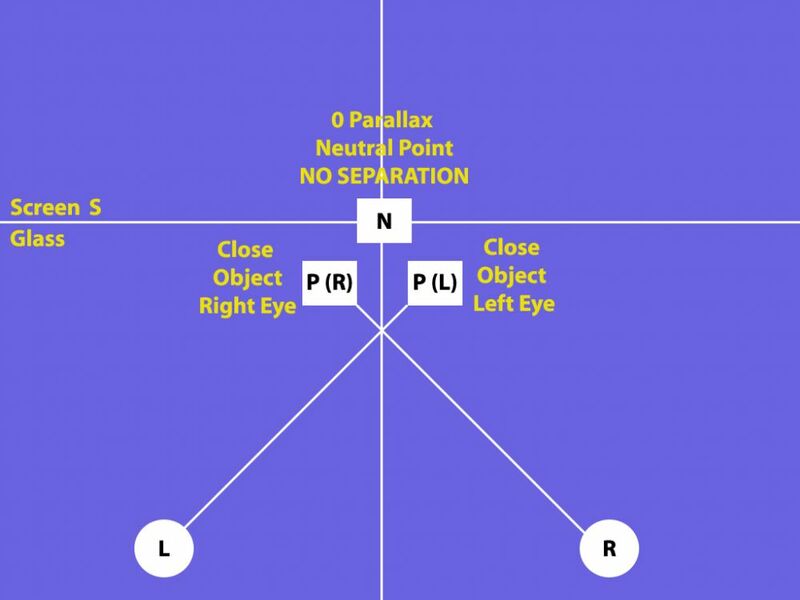 Looking at the diagram, the entire background is in position N, and the remaining elements are in P(R) and P(L). This is a pop-out only scenario where the staircase seems to be coming out of the screen from an otherwise flat room. This is a scenario where you get a mix of both a sense of depth and a pop-out experience. This image gives you the best of all the elements. If you look at the back wall on top of the staircase, there is separation between the images. The red is on the left, the blue is on the right, and this is in line with each of your eyes. This image will give you a sense of depth for the rear part of the scene. Up close, the colors have switched over, and the red is on the right and the blue is on the left. 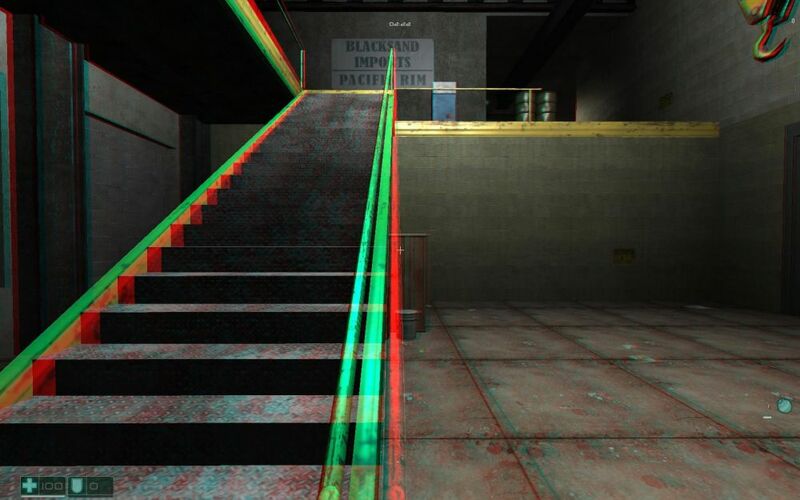 This is the opposite of what your eyes are accustomed to seeing and this flip over creates the pop-out effect for the objects up close like the top of the banister at the bottom of the stairs. Look carefully at the banister of the staircase very carefully. About halfway up, there is a cross-over point where the colors switch over. This crossover makes the banister look like an X. The center of this X is called “Zero Parallax” or what we called the “Neutral Point”. 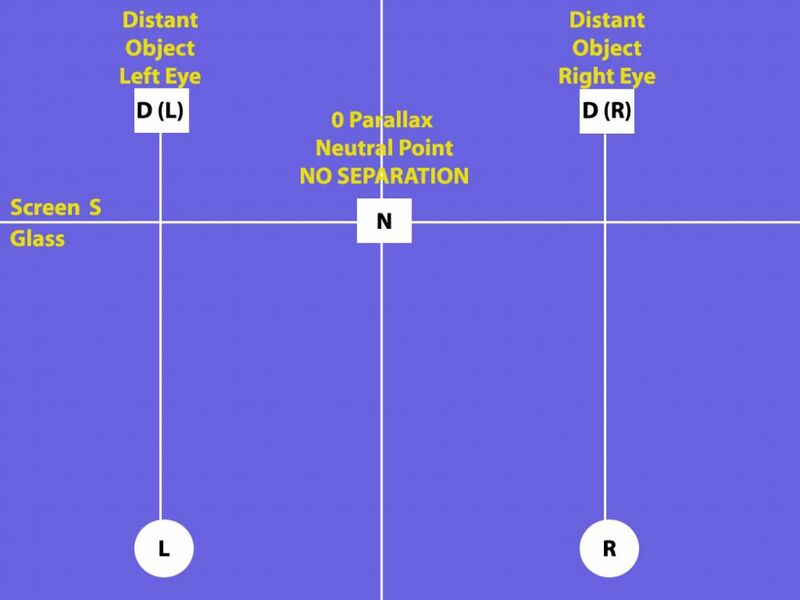 When you are adjusting your stereoscopic 3D experience, you can determine where that “Neutral Point” or “Zero Parallax” location will be, and this is done by adjusting something called “convergence”. Looking at the diagram, the back of the room and top of the staircase is in D(L) and D(R). The middle of the “X” part of the staircase is on N. The bottom of the staircase is in P(R) and P(L). The staircase is an example of an object that crosses the “Zero Parallax” or “Neutral Point” threshold and exists in both plains.